Bill Machrone of PC Magazine has published detailed measurement results of bass performance of several popular MP3 players (including the Dell DJ20, Creative Zen Micro, Apple iPod, iPod mini, and iPod Shuffle). Bill goes into pretty good detail about his measurement methodology and choice of test signals. The surprising result is that the iPod Shuffle has by far the best bass performance of the bunch. A letter to the editor in the Hartford Courant (scroll down to “Honk If You’re Annoying”) makes reference to the practice of mounting train horns on automobiles, but I can’t find an online version of the article in question. Is this actually a fad? Aside from the extreme difficulty in getting a train horn to work in a car (train horns are driven from air pressure, not electricity), does anybody really feel the need to generate 106 dBA of sound at 100 feet? Matt Bartlett has written up the his senior mechanical design project: Design of a High Fidelity Loudspeaker. The speaker is based around the Linaeum dipole speaker and a Seas 6.5-inch mid-woofer. Matt explains his design goals and the logic behind his various component selections and speaker design. The final results look good, but I think his high-frequency results might be misleading because of the dipole nature of the tweeter – it looks like he only measured the response directly in front of the tweeter, and the results fall off sharply above 10 kHz. In my experience with the Linaeum tweeter, I’ve found that the response falls sharply directly in front tweeter because of the dipole configuration, but if you move a few degrees off-axis, the response flattens out. Hey, you never know when you might run into a pipe organ. Springfield’s Old First Church has a nice organ that was restored back in 1997. 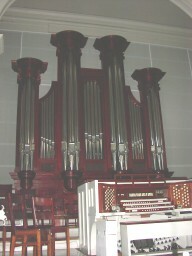 Info about the organ is available here (scroll down). Sorry about the picture quality, the proscenium was not well lit when I took the photo.